update - Dridzt uploaded a fixed scaling.lua in the "Tickets" section (see above) - Iroared has uploaded a beta-version with a fix and a "pretty significant change to the underlying algorithm"
As of 5.4.8, Reforge Lite needs another scaling fix. RFL is unable to calculate correct values/ limits with items upgraded to 4/4 because it handles 4/4 items as if they were 2/2. After calculating, preview looks good, but after having reforged, results are way off limits (i.e. 100-200 points off limit). Working just fine again, thanks for quick update! Ow, it's supposed to be 'method.stats[s]' instead of [i] in the said line (ReforgeEngine.lua#216). Same as the previous post, 1.36 is still bugged when u try to reforge with one of the % stats trinkets from SoO is equiped. The UI doesn't load. dbkey = "Quetzalita - Defias Brotherhood"
Release 1.36 is spitting out errors when you visit the arcane reforger. Prevents the UI from even loading. dbkey = "Angrysteel - Illidan"
First of all, check if the new version works, in eu client data there is a new upgrade path that goes to +16, maybe its the one asian versions use. Doubt it though, because same thing happened last month and asian clients had yet another upgrade path for this. Anywho, typing in a command like /dump GetInventoryItemLink("player",10) will print the link text for an item in the given slot (10 is gloves i think, try different values from 1 to 16). The link is something like "\Hitem:12341:32:324:2:3:4:3\h\cff00ccff[Gloves of Whatever]\r\h" etc (just typing random numbers here). One of the last numbers is the upgrade ID, it should be around 400. If you could find the values for asian items with different upgrade levels, that would help. Maybe I can help you, but what should I do? I know, I haven't updated it for new items yet; however, I can't get the upgrade IDs for those items as I don't have an asian client, so it might take some more time. Hi, it's not working for asia 25 raid items, i.e. 561 iLv ones. Can you pls fix for that. Oh oops thanks, forgot I gotta add it manually. I have been getting incorrect reforges, using both advanced and basic. Specially when the stat weights are close including excess over expertise caps despite setting it with a 0 over weight =). Sites like wowreforge are giving me far more accurate results but I really dislike using them. 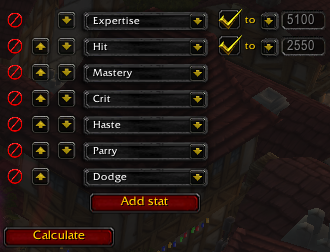 I have been a strong supporter of this addon, I am the "min/max" guy for my progression guild and dabble in all classes. I have them all on this addon, many are showing the same results. I wish I had more info to give but perhaps you could spare some time to hop in game and run a few tests? I am sure the community would name their first born after you, Iroared, son of .... perhaps not. Anyways, love the addon and thank you for your contribution to the community. I am talking about Windwalker haste cap for energy capping. Windwalkers want about 5-6k haste as well as hit and expertise cap. We weren't talking about problems with numbers being wrong, we were talking about needing the 3 or more different stats that we can set caps for instead of just 2. I have this problem as well. On my warlock, I can reforge using the default Affliction profile, but that's it. If I try any other profile, it does nothing.